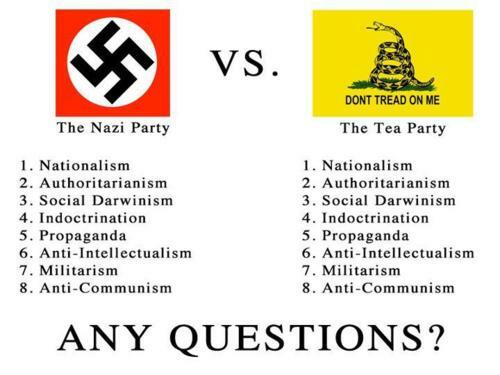 *Mexikaresistance.com Editor’s Note: Fascism and the Tea Party, as Amerikan as apple pie! From my point of view, it was all pro-Constitution, pro-America. I never did anything. There really weren’t enough people involved to be a gathering, let alone a rally. It was basically a scattering of people across the continent just complaining. Gentlemen, first let me say that I am proud to be a member, no, VERY proud to be a member of the American Fascist Party. In the growth of this group over a short time, there can truly be said to be signs of light in the tunnel of recent national history. THE VERY FACT THAT SUCH A GROUP CAN GET TOGETHER AT ALL, AND FLOURISH, SAYS THAT THERE IS STILL LIFE IN THE FURROWS AND HILLS, THE BAYOUS AND GLENS OF OUR AMERICA! Seth (referring to Seth Tyrssen) has done a masterful job of grooming and nurturing the Party, and it is upon this rock that we shall grow and define the coming age. If we take this time seriously, if we see it as the seedling of the time-to-come, then anything will be possible. Here in Texas, there is a great mistrust of the current state of affairs in government, be it local, statewide or national. But also there is old-fashioned patriotism. This calls into play the great burden of the non-stop media indoctrination of the minds of the land, the incessant voice that says if you are against the status quo, then you are against America. Well, WE know this to be utter nonsense, but it will be our greatest challenge, and our sweetest victory, to finally surpass this dark menace, this numbing threat from the shadows, and replace it with the pure sunbeam that is our Fascist Faith, our Fascist Truth. I will, in any way, help the Party to reach its’ goal of a better America, and a better future for our people. Let our cry be of FAITH in the future, love of FAMILY in this present desert of the emotions, and always NATION as the beacon of our lives, and the touchstone for the security of our children. Read The Entire Article Here: Tea Party Leader Defends Membership In Fascist Group (VIDEO) | Addicting Info.